There’s nothing quite like seeing the beauty of Zion National Park from the back of a horse. We humans have been riding for 4,000 years, but ever since the introduction of the automobile, we seem to have completely lost touch with our equestrian past. Imagine hearing the rhythmic clip-clop of your horse’s hooves and breathing in the smell of leather, sagebrush and ponderosa pine as you explore the beauty of the Zion National Park area from atop your horse. At Zion Ponderosa we invite you to be a part of the true American western experience on a Zion National Park horseback riding vacation. Everyone from the youngest to the oldest will enjoy escaping the traffic and the crowds and taking a moment to relax and enjoy nature the way the folks of the old west used to do. We understand that many people wish to have a genuine outdoor experience but cannot spend the time or don’t have the gear to undertake a long expedition. Our Zion horseback riding tours are the perfect solution for those nature lovers who just need a short escape. 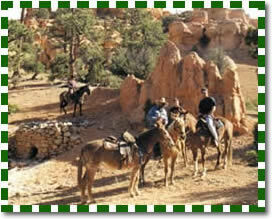 At Zion Ponderosa Ranch Resort you can choose from half-day, full-day, or overnight horseback riding excursions. Zion Ponderosa Ranch at Zion National Park is an all-inclusive resort located on the east rim of the park. We offer great horseback riding tours for all riders, from beginners to the most advanced. Zion Ponderosa was once home to a pioneer logging camp, many of the old pioneer trails and roads remain and provide rugged trails perfect for Utah horseback riding. Click on our Zion horseback riding trails page to learn more about the great horseback riding tours that we offer.